Heritage Red Fife Wheat – The revival of Red Fife in the Canadian food scene is helping bring variety and farmer identification to food crops. Artisan bakers who are now using Red Fife making their own signature baked goods using its flour. Bread made with this old but not ancient grain tastes exactly like old fashioned bread your grandma used to make. This Canadian heritage wheat delivers a distinct, nutty flavour, slightly sweet and is rustic red in colour. Used when making waffles, muffins, bread and buns, this grain brings your taste buds back to the “good old days”. This recipe I sort of adapted from a whole wheat recipe I have for my bread machine. 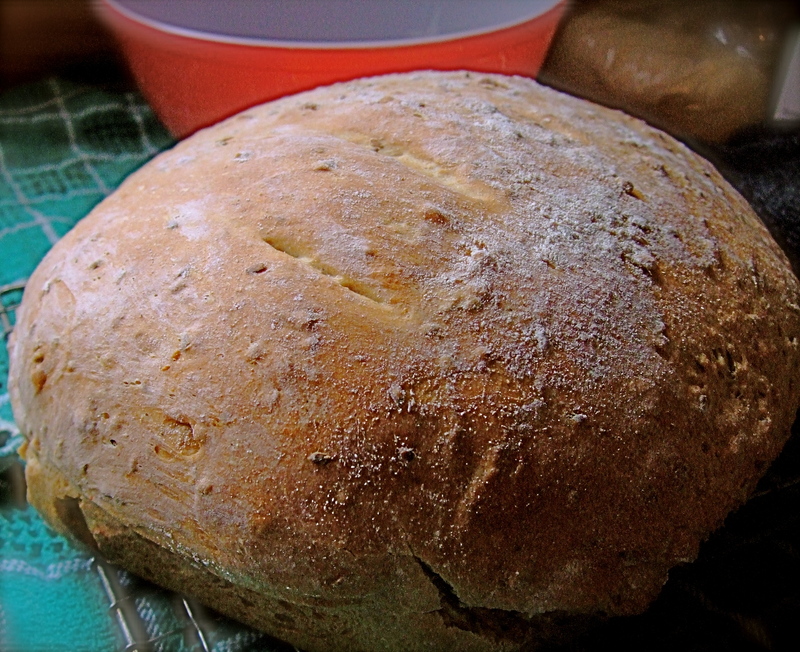 It made such a lofty dough, that this recipe made for me one large round or two regular sized loaves. I decided I needed to bake it in the oven for that traditional home-baked bread feeling. This dough is also used to make rustic dinner rolls and enjoyed with plenty of fresh butter. Measure ingredients except for seeds into bread pan in the order listed. Select the “whole-grain” setting on the bread machine, 2 pound setting. You may need to play with a little more liquid, depending on the moisture in the air on baking day. The dough should not be too dry, and thump around in the pan. Add seeds when the machine indicates. Allow dough to form and rise. Remove dough from the machine before it starts to bake. My machine was about 2 hours. Shape into a loaf and place on a lightly floured cookie sheet if making a round, or place in 2 well greased and floured loaf pans. (at this point you can freeze one loaf, well wrapped in plastic for future use) Allow to rise by placing a warm, damp towel over top and placing in a warm, draft-free area for 45 minutes or until twice the size. Bake at 375 – 400 degrees for 30 – 40 minutes. Let cool for at least 20 minutes. You can make this recipe and form dough into small loaf buns, bake for 30 minutes at 350 – 375 degrees. * I added 1/2 cup cracked spelt soaked in 1 cup of warm water for an hour to this recipe with amazing results. This entry was posted in Uncategorized and tagged Bread, Organic Stone Milled Flours. Bookmark the permalink. I was lucky to find this triplecordcsaorganicproduce.wordpress.com website. Thank you for sharing this information. I find it very informational as I have been analysing a lot lately on practical matters such as you talk about. Thanks for sharing good knowledge Organic Red Fife. could you use soy milk rather than the rice milk? I can’t get localy produced rice milk. yes, you can use any kind of milk. Even nut milks work well with this for an added bit of protein. For healthy reasons, make sure your soy milk non-gmo and is not sweetened with corn syrup solids as most are.